Back pain is a common occurrence and almost all of us experience it at least once in our life. There are some back pain treatments that you can do at home to help you feel better. At-home back pain management practices go a long way in helping you deal with not only your pain but also allow you to get on with your life in a healthy and pain free manner possible. 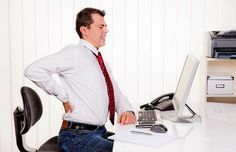 Good posture – Maintaining a good posture is extremely important as slouching and slumping can put a lot of stress on your back. Stand as well as sit tall and keep your shoulders and stomach pulled in to support your back. Exercise – Before deciding on an exercise program it is important that you talk to your doctor as to what exercises can help can help in strengthening and stretching your muscles. Strong and flexible spinal muscles keep your body balance better and decrease the chances of injury and back pain. Hot/cold therapy – Using heat and ice packs are a very famous way of dealing with pain as heat is known to reduce stiffness as well as pain while ice has the property to bring down swelling and reduce pain. Over- the counter pain relievers – These medications help you get respite from pain as well as swelling and include medicines like acetaminophen and NSAIDs. Rest – Giving your back the much needed rest is important in order to avoid further damage. Take things slowly for a while and returning to your normal physical activities gradually can help you get relief. At-home remedies are good for back pain episodes that are not severe and last for short period of time. However, when back pain is severe or disabling lasting longer than a few months, it is imperative that you see a doctor.